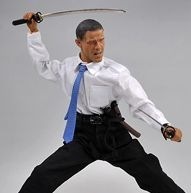 Today’s game idea comes from an epic Obama action figure I saw on Gizmodo the other day. It’s an awesome-packed combo the likes of which the world has never seen. President Obama. As a ninja. Rushin’ the Russian – Ninjobama would need to stealthily sneak past Vladimir Putin’s guards to find the right guest bedroom in the White House where Putin is sleeping. The mission is accomplished by slipping a laxative into Putin’s bedside glass of vodka, thus preventing him from casting a critical un-American vote at the next day’s top secret UN meeting. Oh No She Didn’t – Ninjobama’s sources caught wind of Hilary Clinton’s secret plan to send Obama’s limo to the wrong address so she could swoop in and deliver the State of the Union address herself. The mission: defeat a throng of guards and release a group of hot female interns that Hilary is keeping in cages under the capitol building, and leading them across town to Bill’s office. Anyway, you get the idea. Even if you couldn’t get to that level of detail, just putting the Obama-as-a-Ninja concept into the Xbox community games store would definitely get some great buzz and attention. Not sure whose copyright wrath I’d rather avoid, ABC’s or NBC’s. Anyway, today’s Xbox Live community game idea is pretty basic. It’s a puzzle game based on the MacGyver concept of escaping a difficult situation using some basic everyday items, such as diffusing a bomb using only a pair of shoelaces, a ballpoint pen, and a piece of aluminum foil. There are a couple of different ways you can approach this concept, but I’d probably take the SNL angle of doing a spoof of the original, and focusing on a series of quick mini-game style puzzles with completely unrealistic situations. For example, the game may start with a Richard Dean Anderson-like character who is sitting in front of his TV playing the MacGruber game on his Xbox. He clicks on an item on the screen and suddenly his TV is taken over by Rick Astley’s “Never Gonna Give You Up”. 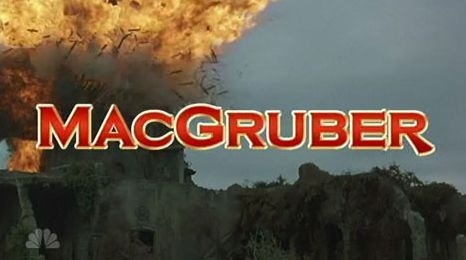 Your task for puzzle #1 is to use the correct combination of items that MacGruber has around him to build a flamethrower to make his TV explode in order to stop the video from playing (in this case – a straw, the batteries from his Xbox controller, some steel wool, and a glass of Tennessee Whiskey). You have a timer that is counting down on your screen, and if you don’t get the correct combination of items in time, your punishment is a mandatory 30-second rickroll that you must watch in order to move on to the next situation. You’ve probably seen a video of a Rube Goldberg machine, such as this one the MythBuster guys put together a while back. My idea is pretty straightforward – a video game where the goal is to earn points by putting together the most complicated possible Rube Goldberg contraptions. Instead of just starting with all of the parts needed to build a Rube Goldberg Machine (RGM), the player would start the game with a small number of parts, such as a bowling ball, a ramp, a helium balloon, and a set of dominoes. The goal of round one is to release a trap door that drops down new parts that would allow you to build even bigger machines. Each round gives you the opportunity to get access to more and more parts, while each new set of parts allows you to get the next set of parts. Users would be able to make choices that lead to different paths – for example, you can light a fire to burn the string off a helium balloon, but the fire would leap up and light a box of dynamite that would blow up an unlocked set of parts. Ultimately, the game would end with the massive final machine accomplishing something ridiculously insignificant, like opening an option in the game that allows you to change the background from black to dark brown. Announcing the 1st Annual ASAD Game Week! If the Discovery Channel can dedicate an entire week to shows about sharks, I think it’s about time to have a theme week over here on the A Startup A Day blog. 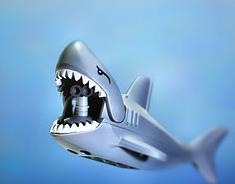 And as much fun as it would be to come up with five consecutive shark-related iPhone or Facebook apps (Sharkster, anyone? ), I’m going to be focusing my ideas this week around games for the new Xbox community games platform. I’ve been playing around with some of those games, and along with being a fun side project for hackers, there’s actually a pretty good mechanism to allow developers to get paid. And with the ad-based revenue models starting to shrivel up, this is one of the few areas where users are conditioned and willing to pay real money for some electrons whirling around on a screen. Also, if anyone has any game ideas they’d like to throw out to the community, just let me know and I’d be happy to post it up. Last week this question was floated out on a mailing list I subscribe to, and I put in my 2 cents around my ideation process. A while back I included some thoughts around my process, but here are a few more tactical approaches. Contrary to the ‘random bolt of genius’ story, I find that the best formula for coming up with an idea is to specifically set aside a fixed amount of time to consciously think about startup ideas. Usually this will be a 30 minute block of time that I carve out of my day, maybe during my morning commute or an after-lunch walk through the woods around campus. I’ll generally start with a broad constraint (usually either a new platform such as social apps or mobile apps, or a problem space that I’ve identified) and then just think on it until I come up with a few broad options. Then I’ll pick the one that seems most interesting and drill down into it until I can either pull something together or decide to scrap it and start over. Another approach is to think about a new technology that has very little market share and imagine what would happen if it were to gain share very quickly over the next year. Then try to imagine the biggest problems that it would cause the average consumer. For example, imagine that in one year the share of computers that have touch screens will increase dramatically. How will that impact the millions of web sites that have been designed primarily to be used with a mouse/keyboard? So that’s my process? What about you? Where do you find that your best ideas come from? I’m following up on Monday’s celebrity guest post from Mark with a insurance-related startup idea. I’d love to go into some deep actuarial analysis of a Baysian system to better calculate insurance odds or a mashup featuring a heat map of the most common locations of auto crashes, but I’m gonna keep this one pretty simple. The basic idea is a Mint-like site that pulls together all of your insurance information into a single, consolidated location. I don’t know about you guys, but I’ve got separate auto, house, life, wedding ring, and travel insurance. With this site, you can add in all of this information and get updates on the renewal dates, premiums, deductibles, and all that other fun stuff. The revenue potential is what’s really interesting about this idea. Users can enter some basic demographic information and see how their prices compare with other users. The system can also suggest other carriers who can provide lower rates, and generate revenue by passing these leads along to the insurance carriers. Any thoughts on this one? As always, give it to me in the comments below. I’m slowly inching up on my two year blogoversary and one of best outcomes from my blogging adventure has been the opportunity to meet interesting new people and discover new ideas. Way back in the early days of the blog I started receiving a few insightful comments from a reader named Mark. He had a great startup blog that I enjoyed reading, but over the past six months it had gone a bit dark. However, Mark sent me a message the other day letting me know about his latest venture and asked if I’d like to do a post exchange. I’m always up for giving my readers a break from my drawn-out blatherings, so here’s a post by Mark on the power of execution over ideas. And if you’re interested, I’ll be thinking up an insurance-related startup idea that may be posted over on his new blog shortly. Mark runs a startup insurance site, covering a broad array of Insurance News, called CrackInsurance. He is a long time reader of A Startup A Day (always wondering why there isn’t actually "a startup a day") and jumped at the opportunity to help readers of this blog practice the art of execution. People have often approached me with different business ideas for the web with grand thoughts about being the "next big thing." It’s actually pretty easy to come up with new web-related business ideas. The difficulty is coming up with good ones 🙂 Frankly, some of them are easy to throw away, but others actually need execution and not just market research. To generate the ideas, you may read A Startup A Day, which manages to enlighten us with all sorts of great business ideas, or search Google, or go to multiple sites that discuss idea generation/actual ideas that are in play. Since they will get your creative juices going, they are all great places to visit and browse. In fact, some of them may be great businesses themselves (e.g. one of the great business ideas on the web has been teaching people how to make money on the web, ironically enough). But let’s talk reality. Execution has been and will always be the key. In fact, I know this sounds heretical, but I’ll go so far as to say that when it comes to the web, we’ve entered the maturation stage. Meaning, the majority of new businesses have been thought of (e.g. try to find a good domain name) and tried. Does that mean there’s no opportunity? NO. It means that you will have to execute better then the next person and, as scary as that seems, that’s the true art. Find an idea that you are willing to throw yourself behind 100%. Map out why you will be better than the competition. Run the site for a defined period of time. Now, map out why you will be better than the competition, one more time! Re-tool the site to fit your refined vision. Methodically execute on the tactical steps that need to be taken. Repeat the prior 3 steps, until you achieve ultimate success!